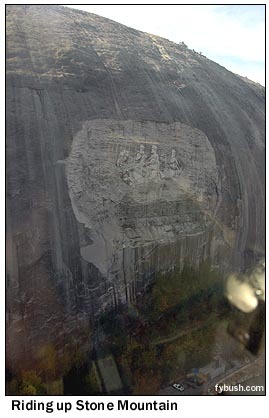 "Georgia's Stone Mountain Park," some 10 miles east of Atlanta, is a slightly tacky shrine to the Confederacy - and the home to one of the more oddly-situated TV/FM sites we've happened across. 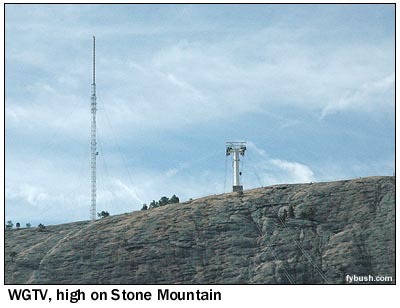 Georgia Public Television's WGTV (Channel 8) is licensed to Athens, some 40 miles off to the northwest, but it's really an Atlanta station, serving the region from this 312' tower perched atop the solid mass of granite that is Stone Mountain. Getting here is an adventure in itself - after paying the admission (er, "parking") fee to enter the park, we then lined up for the aerial tram that carries visitors from ground level up to the top of the mountain, passing along the way the monumental carving of Lee, Jackson, et al sculpted into the side of Stone Mountain. 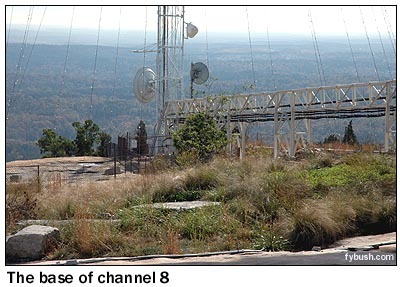 A careful look at the tower will reveal that there's a set of FM bays below the TV antenna (which apparently is now a broadband model that can also handle WGTV-DT 12.) That's the former home of WABE (90.1 Atlanta), the city's public radio station, which has moved around a bit over the years and is apparently back to operating from one of the towers just east of downtown. WABE is a sister station to WGTV's public TV competitor in Atlanta, ironically enough - it's operated by the Atlanta Board of Education in conjunction with WPBA (Channel 30). And before we leave Stone Mountain completely, how about the view of the Atlanta skyline through a dozen miles of haze? Downtown Atlanta is at the left, with midtown in the center and Buckhead at right. Look carefully to the right of Buckhead and you can see a candelabra tower, which I believe to be that of WAGA (Channel 5). Thanks, as always, to Roddy Freeman for his Atlanta hospitality! - Find out when the new Tower Site is posted, and much more! Follow us on Twitter @NERadioWatch - and don't miss your chance to order the all-new Tower Site Calendar 2011 at the Fybush.com store!